Winfilter is the PUP that uses misleading techniques to prevent removal. Use Reimage to locate malicious components and get rid of them faster than with uninstall instructions. A full system scan blocks virus reappearance and prevents traffic to malicious domains. What is WinFilter and how can it affect my computer? How did Winfilter find its way to my system? How can I remove Winfilter and its files from my system? This adware is designed to promote its third-party sponsors and to boost the traffic of their websites. Be mindful and do not let your curiosity trick you to click on these ads – some of these ads will redirect you to websites that may be really infectious. We recommend to bypass downloading any apps from such websites. In general, if you want to avoid such dangers and your aim is to keep your system safe, you should install a reliable anti-malware like Reimage, which will detect and destroy risky applications from your computer. If you have already noticed Winfilter ads, it means this adware has already slithered into your system. You are probably interested, when and how did this happen? The answer is, you need to be cautious every time you install a new program, especially a free one. The developers of freeware and shareware bundle programs together, and just because many computer users tend to choose ”default” or ”standard” install options, they end up with PUP on their system. If you wish to avoid that, first of all, you need to be sure that the website you found the freeware file is safe. After that, on the program’s installation process you need to opt for ”custom” or ”advanced” settings and untick all the boxes that suggest you to install Winfilter adware or other additional apps. If you didn’t know such information before and you suspect that you have already installed Winfilter on your system, it is highly recommended to uninstall this PUP. 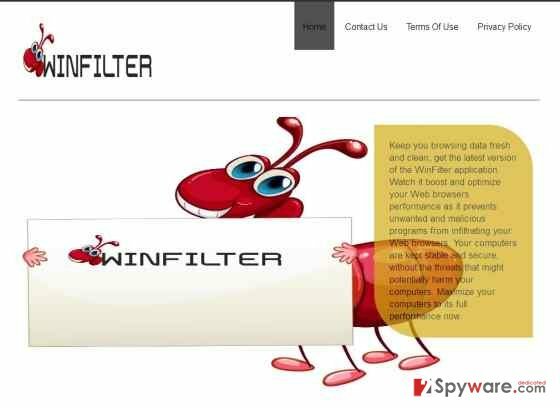 There are two ways to delete Winfilter from your system – you can do it manually, or with a help of a professional tool – anti-spyware, which will find and delete all program files. Uninstalling this PUP manually may be not completely safe – this program can hide its files in the invisible AppData folder, or even change your registry settings to complicate the possibility to remove Winfilter manually. However, you can try to delete it by yourself. We have prepared detailed step-by-step instructions on how to do it. You will find them below this article. Here, look for Winfilter or any other recently installed suspicious programs. Wait until you see Applications folder and look for Winfilter or any other suspicious programs on it. Now right click on every of such entries and select Move to Trash. When in the new window, check Delete personal settings and select Reset again to complete Winfilter removal. Once these steps are finished, Winfilter should be removed from your Microsoft Edge browser. Here, select Winfilter and other questionable plugins. Click Remove to delete these entries. Now you will see Reset Firefox to its default state message with Reset Firefox button. Click this button for several times and complete Winfilter removal. Here, select Winfilter and other malicious plugins and select trash icon to delete these entries. Click Reset to confirm this action and complete Winfilter removal. Here, select Extensions and look for Winfilter or other suspicious entries. Click on the Uninstall button to get rid each of them. Now you will see a detailed dialog window filled with reset options. All of those options are usually checked, but you can specify which of them you want to reset. Click the Reset button to complete Winfilter removal process. This entry was posted on 2015-10-05 at 05:42 and is filed under Adware, Viruses. You can quickly scan the QR code with your mobile device and have Winfilter ads manual removal instructions right in your pocket. How did you remove Winfilter ads?